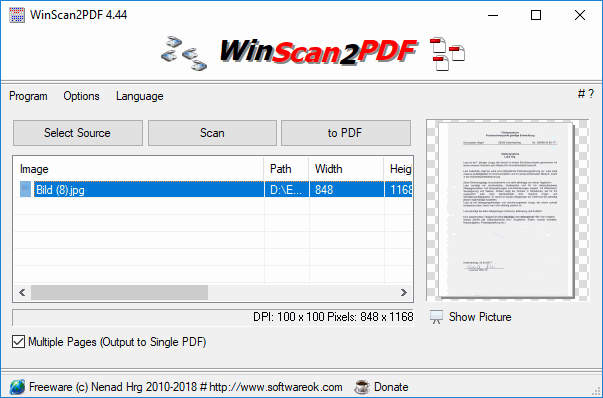 WinScan2PDF is a very small program for scanning documents and saving them on your computer as a PDF by using any installed scanner. Privacy note: The program does not automatically clean up scanned JPEGs, which are left behind in a temporary folder. How to extract: Download the "Portable" ZIP package and extract to a folder of your choice. Launch WinScan2PDF_p.exe. General optimisation and improvements plus customisation. Can't you disable it saving temporary files in the options? @Emka - The first item under OPTIONS look like you can set the utility to delete the jpgs when you exit the program. I have never been very sure the program actually does what it says, so I simply use the second item in OPTIONS to check and delete as necessary. Periodically I use the jpg instead the pdf so I actually find this useful. Bottom line is that I wish the author would clean all this up a bit more, but I find the utility so useful (use it every day almost) that I am prepared to work around the idiosyncrasies. @__philippe thanks for the help I appreciate very much. 2pages displayed file can be splitted into 2pages 1files.